Oceanfront home with panoramic ocean views that are truly spectacular. 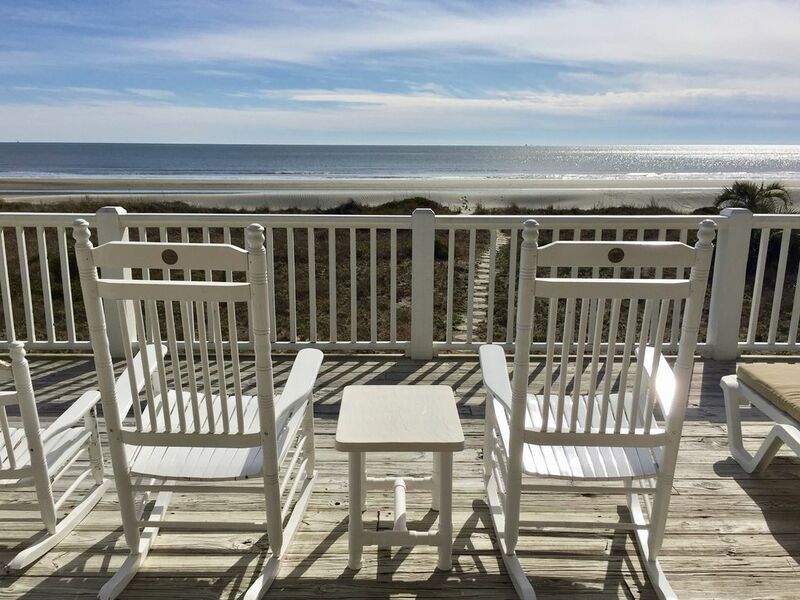 The beach and water views are especially nice from the sunroom, dining/kitchen area, master bedroom and, of course, from the fantastic beachside deck. Our house is very close to the beach with a private path leading thru the dunes onto the beach. This 'beach cottage' has an open floor plan with heart pine floors throughout and a large fireplace made of old Charleston brick to add plenty of character. The master bedroom has a queen as well as a full size pull-out sofa bed, one bedroom has a queen along with two bunk beds (great for kids), and the third bedroom has a queen. The house is located on a great stretch of beach that is uncrowded & quiet. Family owned home for almost 30 years that is very much enjoyed throughout the year by local family members and their guests. Fantastic beach and ocean views. Our home is truly beach and ocean front. Entire beach side of home has ocean views. Private beach access path, 2 HD TVs, 2 DVDs, digital cable, jacuzzi tub in master, washer/dryer, iron/ironing board, complete kitchen cookware. Also enjoy fantastic sunrises over the ocean and wonderful moon and star filled nights from the beachside deck. Great location! Perfect sized house with open floor plan. This house was on one level, so it was great for small children and an elderly relative with a walker. Only steps were to parking and beach. Terrific views of the ocean with numerous windows facing the beach. Plenty of room for dining, playing, visiting and other activities. Second refrigerator worked out well for keeping drinks cold. Loved that there is a 1/2 bathroom downstairs in the parking area. Saved tracking sand into the house. We'll be back next year! Very beautiful. Had a great time. The view is outstanding. My wife and I hosted our 2 sons, their wives and a granddaughter. We hit the sweet spot in size of house. The pictures don't do the site justice. The living space has vaulted ceilings and is spacious. The front porch is huge, maybe 10 x 36. The beach is wide and we were never crowded. Having a half bath outside the house is an extremely useful touch. I am going to reserve for next year and will continue to do so until my granddaughter won't room with her parents any longer. We truly enjoyed staying at this house. It was just right for our small family. We like the location with so many nice places nearby. The house was just the right size for our family of four for a few relaxing days on the beach. The house was clean and had all the amenities we needed. While some of the fixtures and other items need updating, its beach front location and reasonable cost more than made up for it. The owner was a pleasure to deal with. Our beach house is located near the southern end of the island on Ocean Blvd (at the end of 4th Ave). The house is true beach and ocean front located along a very nice stretch of beach. Beautiful and historic downtown Charleston is about 20-25 minutes away and Mount Pleasant is only about 10 minutes. Many fantastic restaurants are close by as well as great golf, shopping, parks, inshore/offshore fishing, crabbing, boating or just about any water activity. A Security Deposit is collected to secure reservations.